2010 Essence of Tea "Nannuo"
I got on very well with the Nannuo from Nada's previous, first tea years of productions (cf. the 2008 and 2009). This year, something is awry! 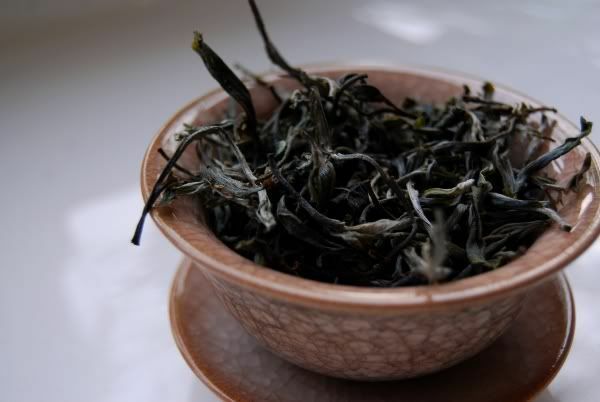 It has mixed leaves, including huangpian [yellow flakes]. 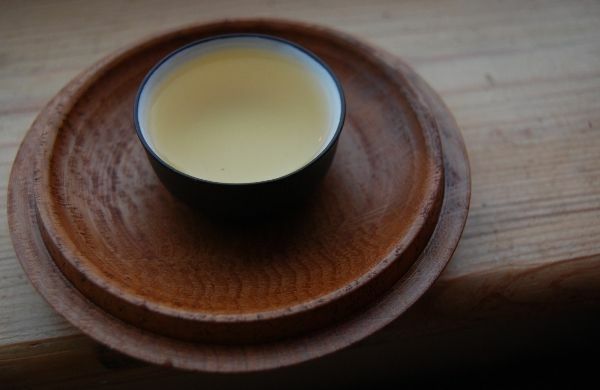 The soup comes out pale yellow, and the scent, while sweet, is thin and quiet. It is cooling on the lips, but provides no kuwei [bitterness]. It is accessible - but not a great tea, this year. In fairness to the vendor, Essence of Tea, the product was originally withdrawn from sale - I'm not sure of its status now. "A little weak and one-dimensional", remarked Lei. Something is definitely afoot with this poor old tea. Given that I recall reading from Nada's blog that he usually stays with the family that makes this tea, I can only assume that there has been some over-cooking or something similar. There is a dry, ever-so-slightly burned character to the tea. While not at all bad, it's not up to the usual standard. Fingers remain crossed for the 2011 Nannuo, for a return to its sweet, wildly floral form. In the words of Keats, "It's not right, but it's OK."
2010 Essence of Tea "Banpen"
Heading out into the outer darkness, beyond the cakes that I most enjoyed this year from Essence of Tea, comes the "Banpen". 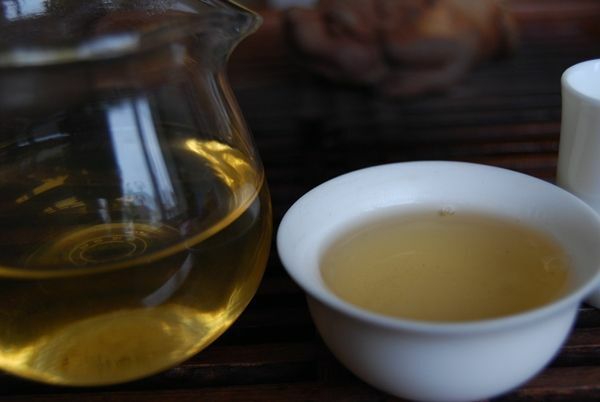 As shown above, this is a pretty long-leafed maocha, and, like its siblings, it has a sweet, buttery aroma and produces a solid yellow soup, as illustrated below. It is big and heavy, but quite reticent. In many sessions with this tea, I just can't get much out of it. It swells to give a large kuwei [bitterness] and huigan [returning sweet flavour after the swallow]. Perhaps most disconcertingly, I find it to be rather citric, and consequently tart in the mouth. 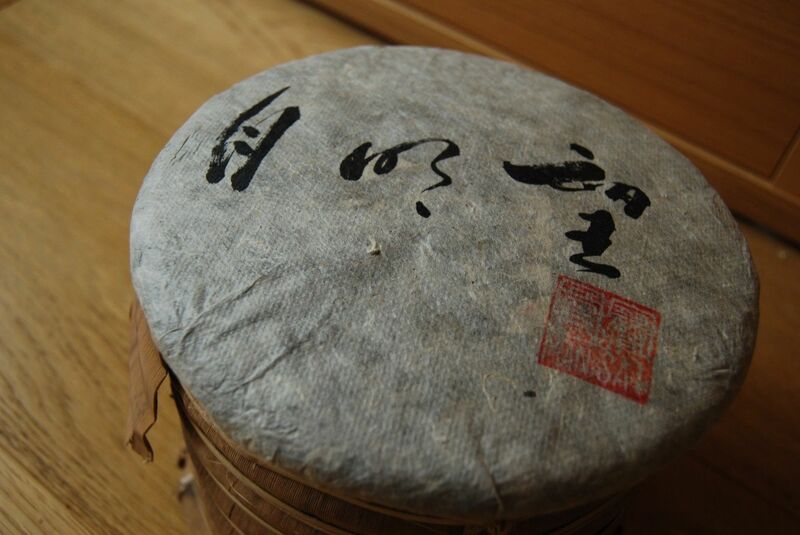 This isn't something that I enjoy in pu'er, and seldom buy cakes with such characteristics. As the infusions pass, the citric tartness dominates. 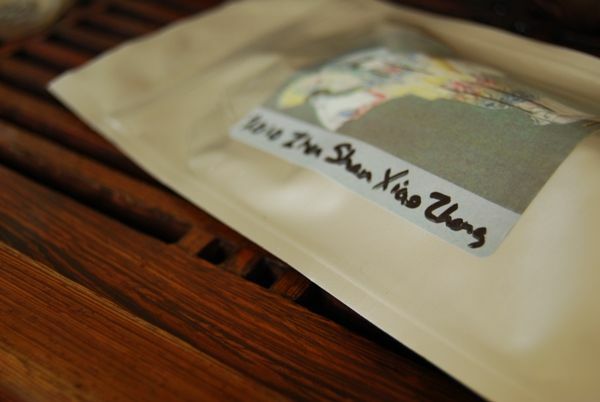 This is a "xiaobing", and so its price-tag of £20 doesn't seem too appealing to me, given the nature of the tea. For just £5 more, one could have a full cake of the Mansai, Bangwai / Jingmai, or Manmai / Bada - and that's where my money was spent this year. 2010 Essence of Tea "Bulang"
This is my kind of tea. Just like the 2009, this 2010 will rend flesh from bone in the most delightful manner. It is, shall we say, quite strong. This cake was made from the same farm as the 2009, and looks the same: small, tippy leaves, with a heavy scent. Long, buttery, brutal. Yellow soup, thick, heavy, fruity, grape-like - everything one could wish for in a Bulang, combined the aforementioned flesh-rending power. Delicious. So why didn't this make it into my "top three" from this vendor, this year, following the Mansai, the Bangwai / Jingmai, and the Manmai / Bada? Simply, the price. It was an obstacle for me, and I will be sticking with my 2009 cakes. The quality of the offering is undoubted - if you didn't obtain the 2009, you may be in the difficult situation of trying to decide if £40 is a manageable price for this cake. That's a decision for each buyer to make on their own. I bought one cake, to compare against my 2009s. 2010 Essence of Tea "Manmai / Bada"
During a previous period of house renovation, occurring at about this time last year, I spent ages drinking only in the office - usually a quite mundane Dayi "Badashan Organic". 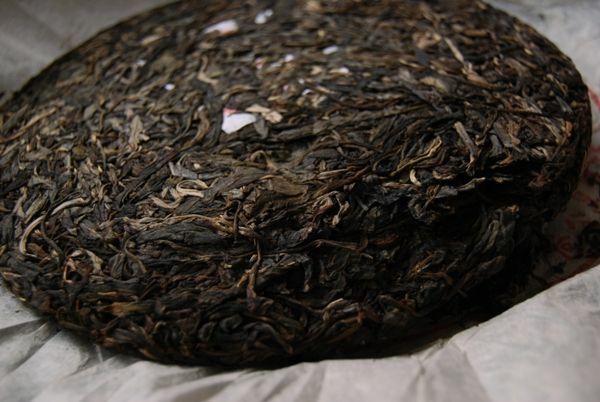 I have become quite accustomed to that particular cake, and found the 2009 Zhimingdu "Bada" to have similar grassy characteristics. 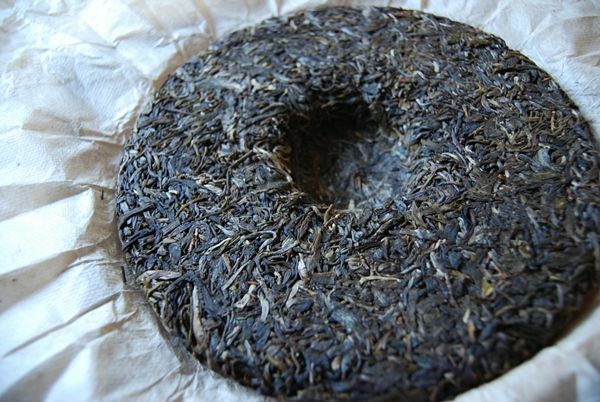 This is a simple tea, being grassy like the other Badashan cakes I mentioned above, but it is redeemed by its cleanliness and its potency. 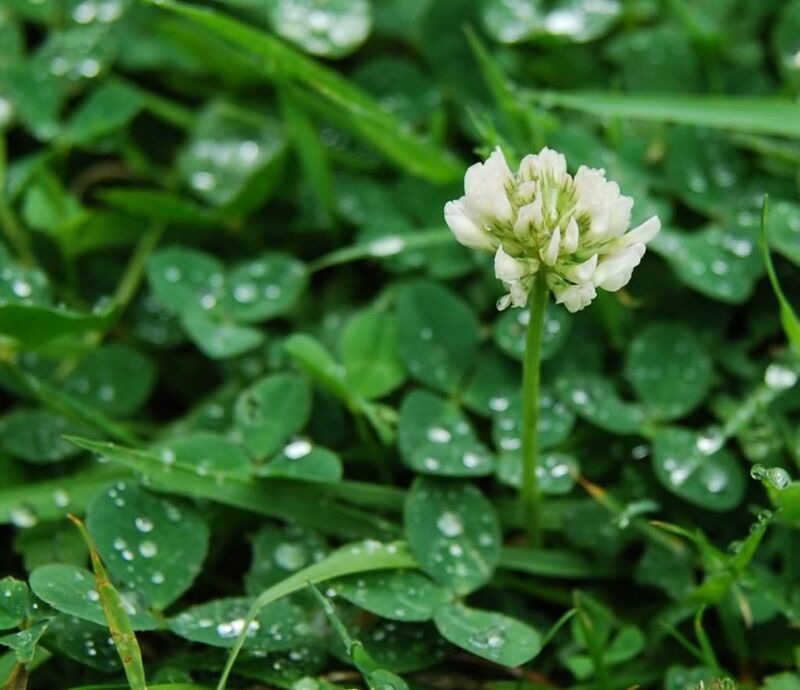 It is quite solid, with a leather and sweet nature that keeps my attention. It cools the mouth, has a mildly effervescent texture, and feels, generally, very good in the mouth. "Quite simple. Nada's teas are always pure", notes Lei. 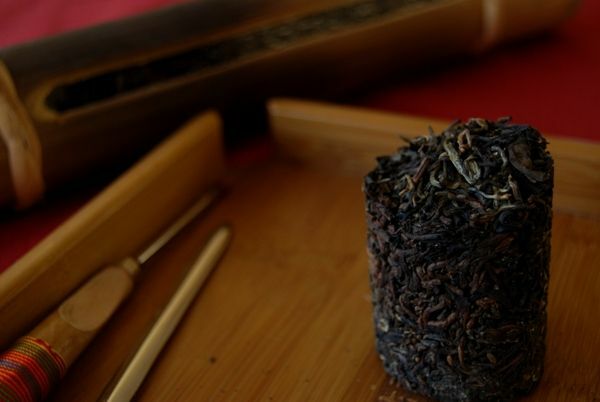 I initially disregarded this tea, due to its simple resemblance to the other Badashan cakes, but over repeated sessions, using more leaf, I was swayed by its constant, potent charms. Be warned, this is an "elegant" tea, but I rather like it nonetheless. After the Mansai and the Bangwai, this cake is a decent buy at the asking price of £25, if not quite up to the excellence of the former. 2010 Essence of Tea "Bangwei / Jingmai"
This is the second of three products from Essence of Tea of which I bought a tong, this year. It comes in a close second to the Mansai. Bangwei is in the Jingmai area, which is a region that I usually appreciate. 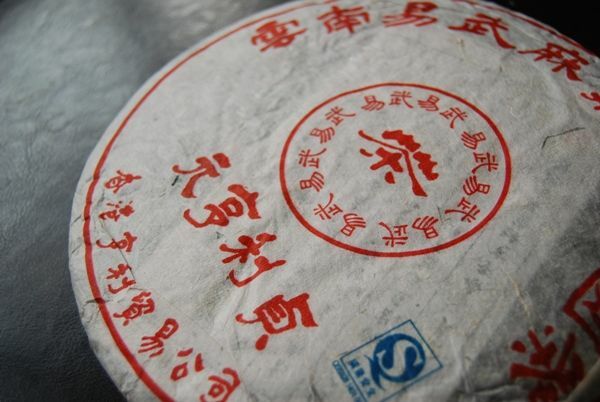 As always, the maocha looks delicious, and well-treated. The aroma is a healthily strong green. Highly energetic, clean, and sweet, this turns out a beautiful yellow soup (pictured below). It is so very thick on the lips, with a resounding kuwei [bitterness] that swells and leaves the mouth watering long after the swallow. I like Jingmai for its dry nuttiness, of which there is plenty to be found in this production: it reminded me somewhat of the skin that grows around hazelnuts, mixed in with its buttery sweetness. As with the Mansai, I have no doubt from the contents of the cup that this is a product of good origin. 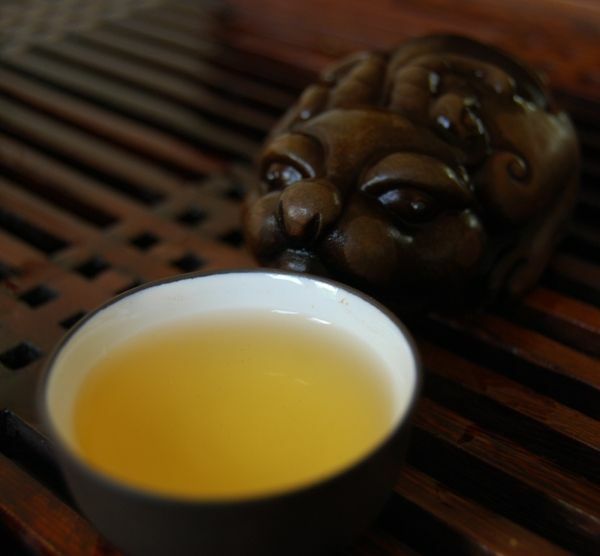 Old-tree tea is never rough, just clean, sweet, potent, and, somehow, just more. More of everything. "Powerful but complex", notes Lei. It lasts very well, and is easily worth the £25 asking price, in my estimation. This is good Jingmai. I haven't touched this tea since buying a tong (shown above). Let's crack it open. Some people love cakes from this vendor; others seem to dislike the vendor on principle. I'm definitely in the former category. I notice with amusement that the village is misnamed on the above stamp, which caused the original version of this article to be similarly misnamed, and which I have since corrected. The "wai" / "wei" confusion often gets me, too. However, I think the name "Bangwhy" is much more funny than "Bangway", so I'll continue to have a place in my heart for the original misspelling. I bought this tong at £25 / 357g cake, which is very good. The cakes in 2011 were around £40something. This year, 2012, they've increased by a similarly large increment. This makes me appreciate my earlier acquisitions a little more. The big question is: how is this tea coming on? It's all very well for me to speak highly of these cakes if they turn out to be insipid, and poorly aging. Thankfully, everything I've bought from Nadacha appears to be going in the right direction. 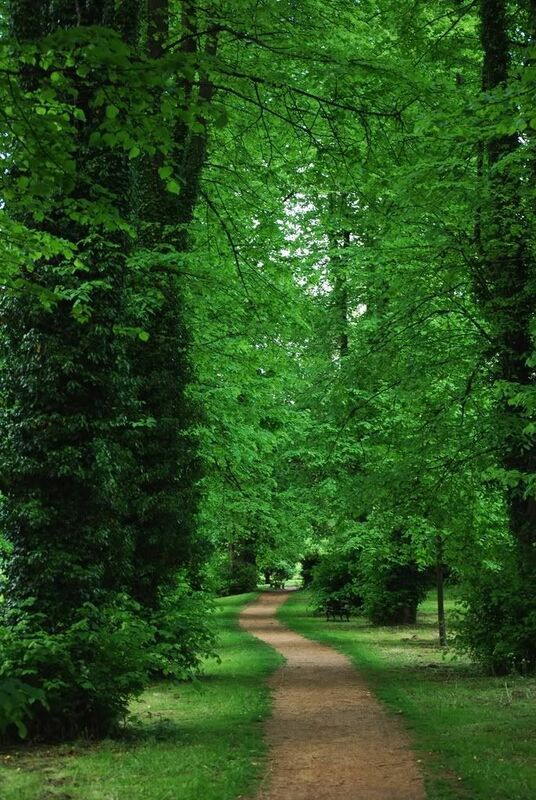 The leaves have darkened in accordance with expectations, as they started off distinctly dark green. It is clean, fresh and potent, with plenty of Jingmai character - a "hairy" sort of nuttiness that reminds me of the skin of hazelnuts. You'll recognise it when you try it, I'm sure. The endurance is really rather impressive: I brewed this for over 20 infusions, and it stayed potent, and, best of all, clean and well-made. Whereas so many recent cakes crack apart and become rough and green, this Nadacha cake reminds me how it should be done: immense potency, combined with superb clarity of character. Fantastic. Bring on the 2012s. 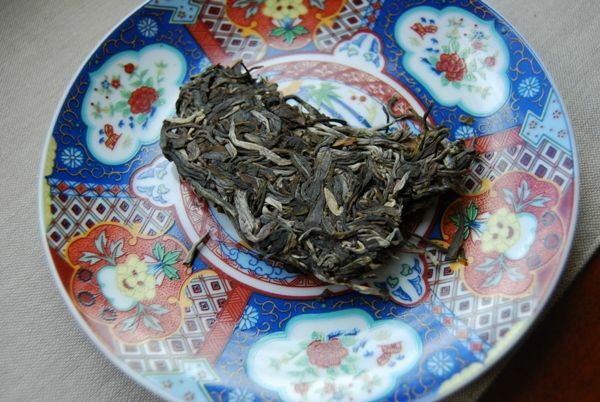 2010 Essence of Tea "Mansai"
We've been undergoing antenatal classes, recently, in preparation for our new arrival. Childbirth and childcare are alien fields to me, so any information is soaked up like a dry sponge. 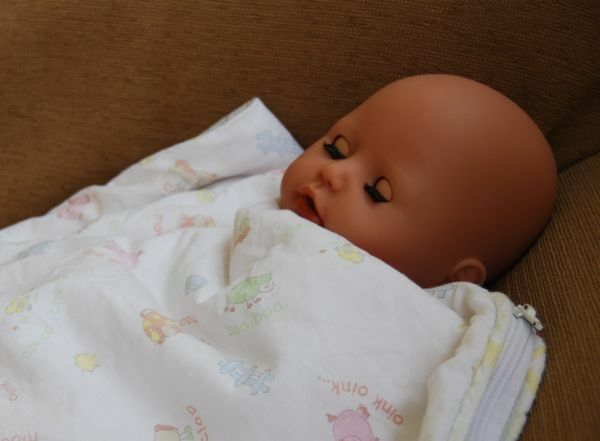 Our antenatal nurse left a life-size, actual-weight infant doll in our house for us to practice changing nappies and so on. I found myself reading my weekly periodicals with Proto-George on my knee. The proprietors of Essence of Tea have also been hard at work, this year, working on their own range of cakes. They range between decent to excellent, and I thought I'd open the batting with what I believe to be the best deal from this year's range - the "Mansai". The story of the tea is amusing: Nada seemingly had to cross a rope bridge to get to the village where this tea was made, in the disputed territories between Myanmar and the PRC, at the foot of the Bulang range of mountains. Adventurous procurement aside, the tea itself, like most hand-made cakes from vendors, is very pretty. The leaves, pictured above, are dark, fruity, and sweet. We have some stems, and some broken leaves (seemingly from the aforementioned journey that these leaves took to reach the outside world). I originally tried this tea as a maocha, and it was immensely smokey. 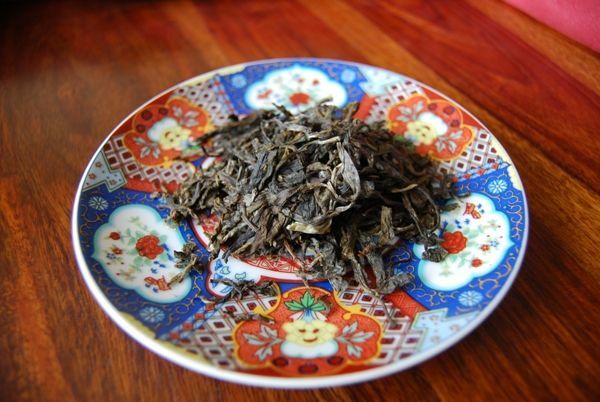 The bingcha version, happily, has seen that smokiness dissipate, making this one of two of Nada's teas from this year that I really love. I'm not really one for nancified, feminine, delicate teas. I can't see them managing to stay the course of years, with their effete, louche, elegance. I'm on the hunt for beefy, chunky, fat, chubby, sweaty, calorific, overweight, aggressively obnoxious teas. It seems that my tastes differ from Nada's in this respect, because the majority of his products seem to be of the former variety. Hence, this cake was something of a pleasure. This Mansai is active from the start, containing a big, buttery scent and flavour. The huge energy and cooling characteristics are testament to the excellent quality of it contents. I detected a hint of dry-roasting from the wok, which Nada conceded. It is a gripping, buttery-sweet monster, with a pure, monolithic kuwei [bitterness], and a similar huigan. 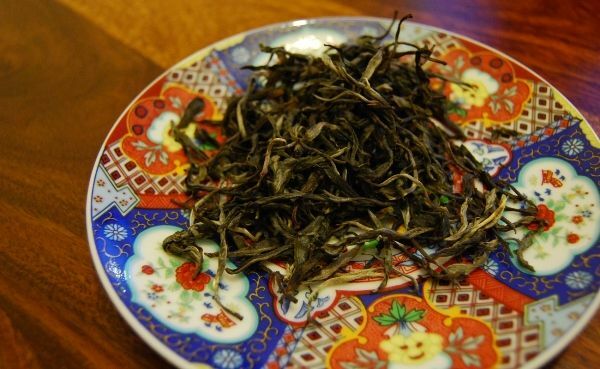 It is dry, like a good white wine, but also cereal-like, as with Lincang and other "outlier" teas. This is one of three Nadacha cakes of which I bought a tong, this year. At £25, I think it's the best value of the batch, in terms of what you get for your money. The quality is not really up for debate. Looking at the first photograph in the above provokes hearty chuckles: the baby that we were expecting back then is now 3.5 years old and bossing his poor father around. Has the 2010 Mansai aged in a similarly effective manner? It took me a while to find, but that is because I did not notice that the tong is entirely unopened - I was looking for paper-wrapped cakes, when I should have been searching in my bamboo zones. It seems that I bought this tong (for a little under £25 per cake!) based on the sample alone, and have not tried any of the actual cakes. 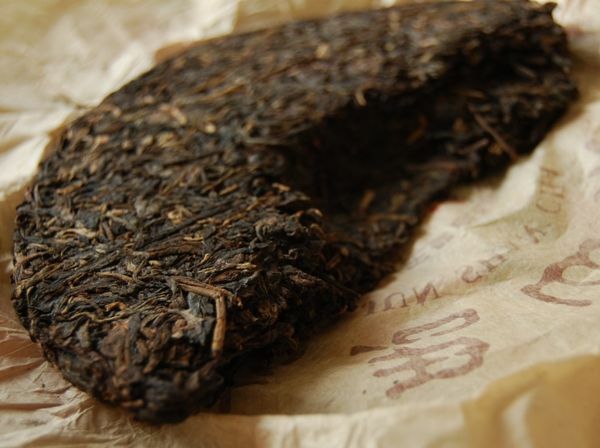 The maocha looks as if it is no longer new: there is a darker, browner hue to the leaves that suggests they have seem some humidity. The scent is sweet. So far, so good. If the original cake was yellow, this is more towards orange (as pictured below). 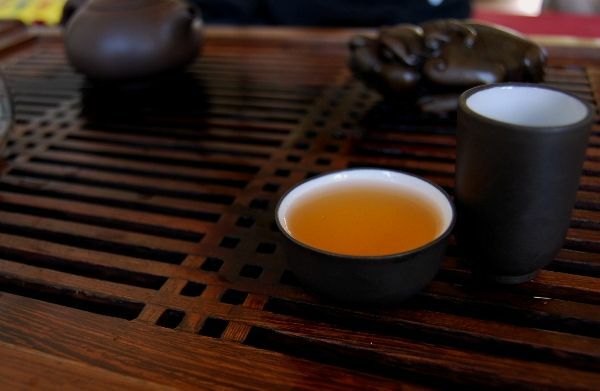 The scent in the wenxiangbei [aroma cup] is straightforward sweetness, with a decent lengxiang [cooling scent] that suggests the tea has some "finish"; i.e., contents that might dwell in the throat. 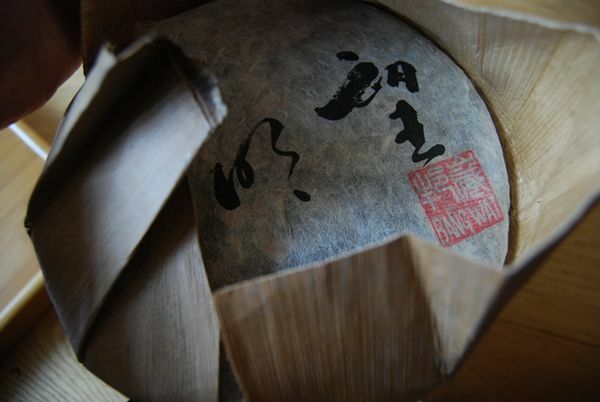 This is confirmed by the characteristics in the mouth: the sweetness remains, the kuwei has settled into a solid, back-end throatiness, and the texture is robust. I can see why I chose this cake: it has the trousers that led me to imagine that it would not fade away with age, and it has a decent base on which "aged" characteristics might build. This turns out to be not too far from the actual state of the tea after four years: it has become low, dense, heavy, and sweet in a most complimentary manner, while retaining trousers sufficient for further aging. The price. Oh, the price! What can you get for a mere £25 these days? Some ropey, grim plantation tea from a no-name factory? What shocking bargaination occurred back then, in 2010, in days when Essence of Tea's prices were perhaps 20% of their current level - indeed, this was a time in which they were probably over-generous (i.e., too low for the quality). It is no coincidence that the majority of the tong in my collection were bought before 2011. I am pleased with how this cake has come on within four years; perhaps a direct comparison to the 2011 Mansai might be sensible. Thanks again to NorberT and Tofu Miso for the suggestion of trying this cake again. This cake is surprisingly good: it is sweet, like dried apricots, and humid. I enjoy its complexity, and its continued strength. 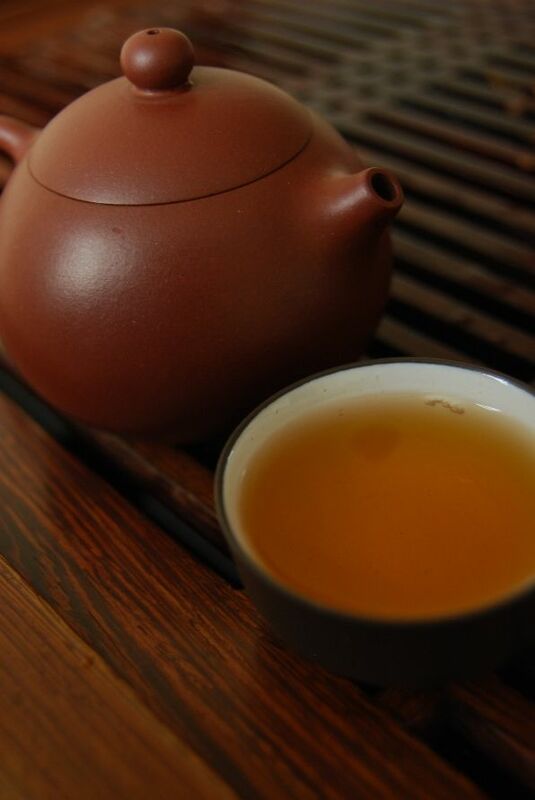 2010 Essence of Tea "Zhengshan Xiaozhong"
Throughout my adult life, I have been on a tea-related quest, of sorts. I am in search of real lapsang souchong, of the kind that one finds in good hotels during afternoon tea. 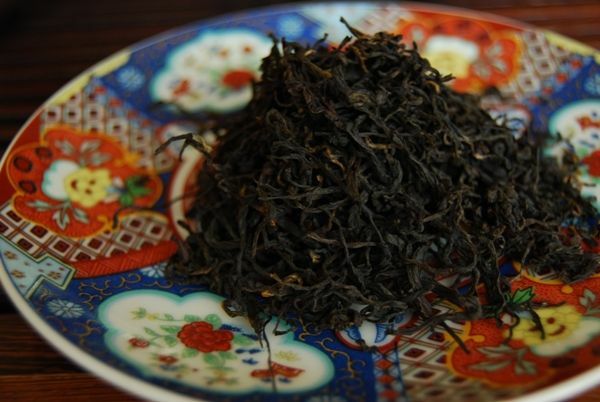 "Lapsang" has a firm grip on the subconscious of my nation, being a charmingly smokey tea beloved of many good Englishmen throughout the years. As a boy, I read that it was Tolkien's favourite tea, and I have consequently been hooked on it every since. 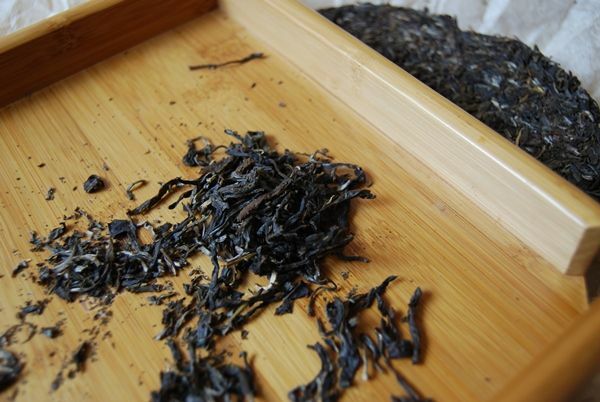 Our local arbitor of pinyin, Lew, would undoubtedly correct the vendor's spelling of "zhengshan"
It is a rare treat, because supermarket "lapsang" is simply low-grade hongcha scented with an artificial chemical. It is much like Earl Grey, the charlatan of English teas, in that it is beloved, as far as I can tell, by people that enjoy watching actors from the Royal Shakespeare Company who should know better than to play space-captains in Star Trek. Thus, we only get to drink good, real lapsang in hotels. Lei and I sometimes head for a quiet session in our local (The Randolph), which provides afternoon tea in the manner of London's famous Savoy and Ritz. 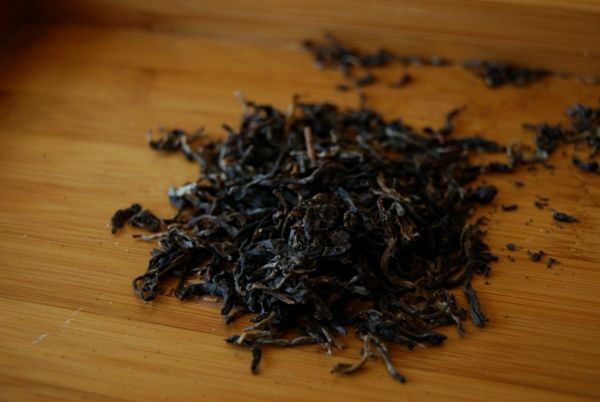 I have bought lapsang from all manner of vendors, and all have been rough, chemically-scented affairs. Where is my sweet, smokey favourite? Does it even exist in retail vendors' stocks? I have long eyed the variety offered by Essence of Tea, and have been considering buying a small sample to see if it is "the real thing", though find myself pausing at the price. 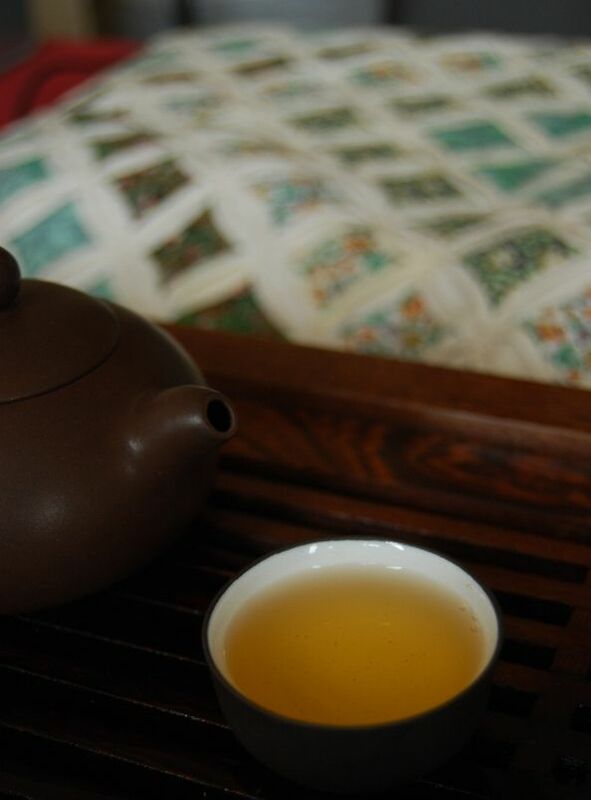 By a stroke of luck, it seems that the network of Chinese wives have been sending one another tea, and so I found myself brewing this welcome treat immediately after its arrival. To Mrs. Nada, many thanks! We are very grateful. 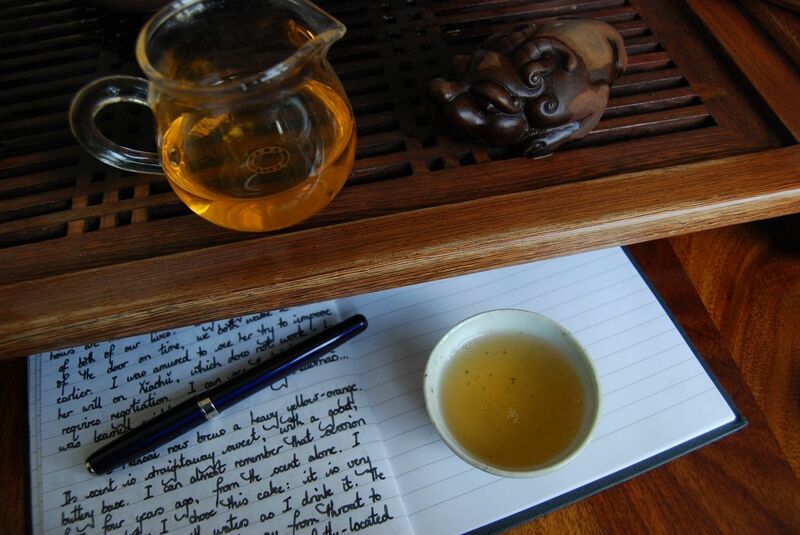 What follows are merely my own notes to myself, as recorded in my journal for information's sake - if you are the proprietor of Essence of Tea, or happen to be married to him, please feel free to stop reading at this point. 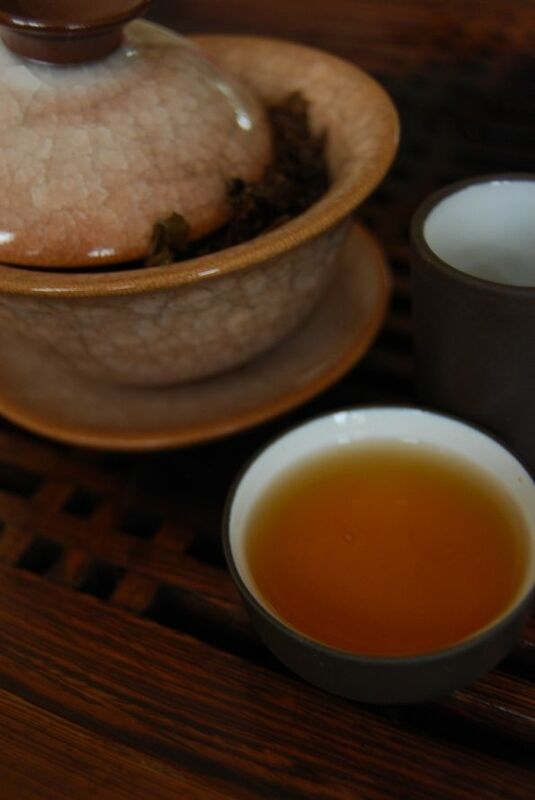 Anticipating a solid lapsang experience, I brought out our gaiwan, pictured above. 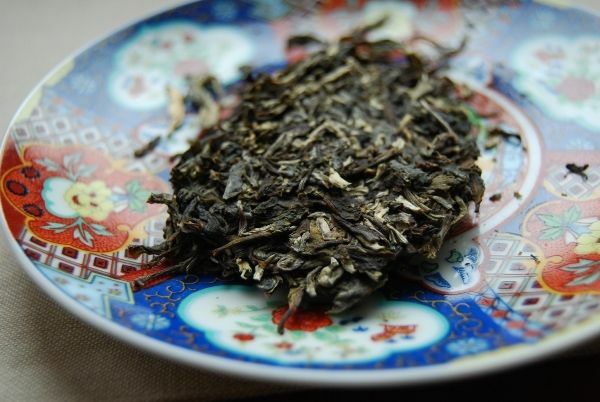 The result was a slick, mouthful of a brew, with a charmingly sweet hongcha aroma. 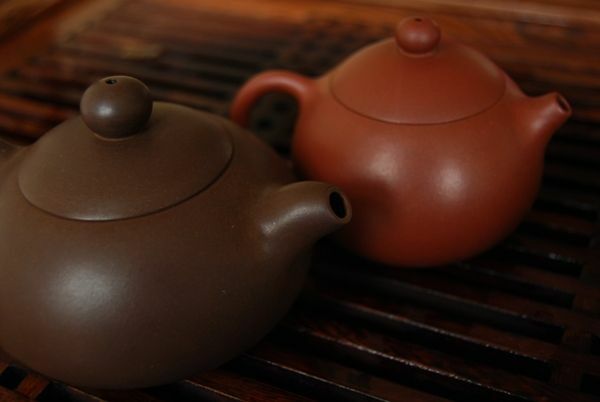 In character, it was similar: deliciously sweet, and elegantly delicate, as I find many of the teas from Essence of Tea. And therein, for me, lies the minor issue, as a man hunting for his long-lost lapsang. 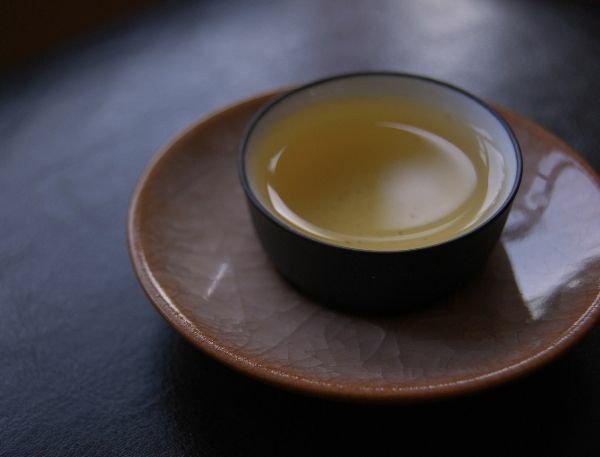 This is a delicious hongcha, but it is not lapsang souchong. 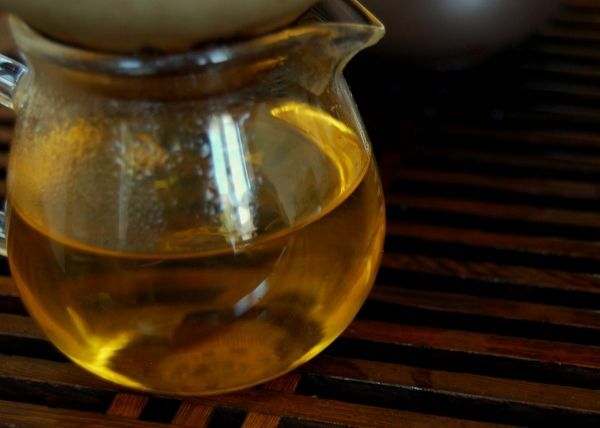 Yes, I know that it was plucked by the thighs of young virgins from the finest tea-bushes in the Wuyi mountain range, and then was gently passed over the combusting branches of pine trees through which ambrosial scents whisper throughout the long, spring evenings. It is an excellent "Zhengshan Xiaozhong". 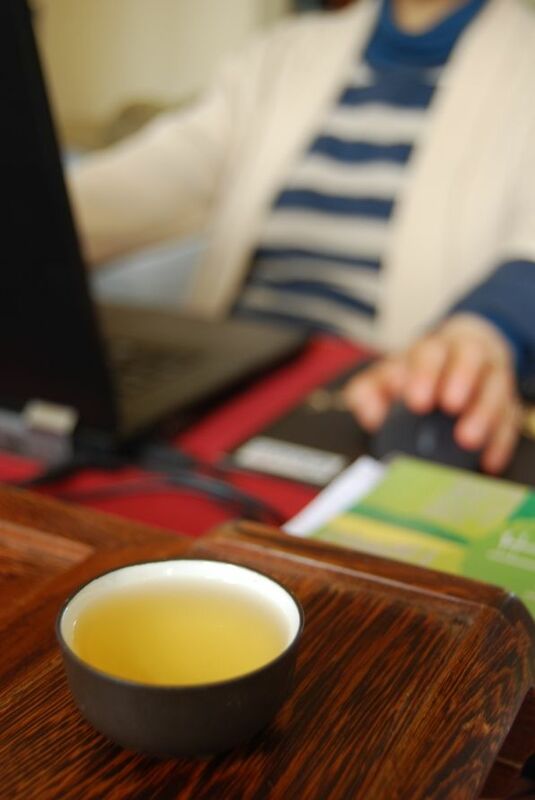 It is first-class hongcha. However, it is not lapsang souchong, as English culture has long appreciated it. This is not to say that English culture has been raised on inferior product - merely that this particular variety is too light, not sufficiently pine-like, not sufficiently sweet-smokey, to be an Englishman's lapsang. 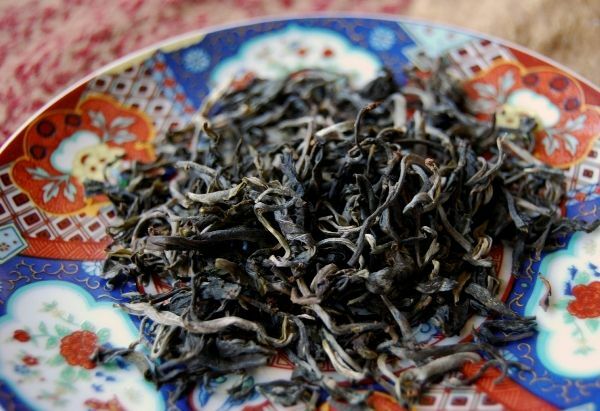 If I were to taste this in a line-up with, for example, a first-class Fujian "Bailin Gongfu", I don't think that I could tell the difference. I really enjoy hongcha. While I don't write about it very often, as I buy good quantities of it from Maliandao, which doesn't lend itself to interesting tea-articles, I spend quite some time with it. 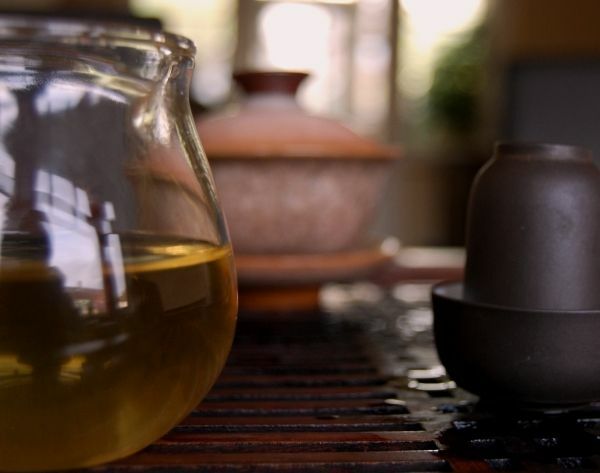 This charming tea is, undoubtedly, just a hongcha, albeit a mighty fine one. 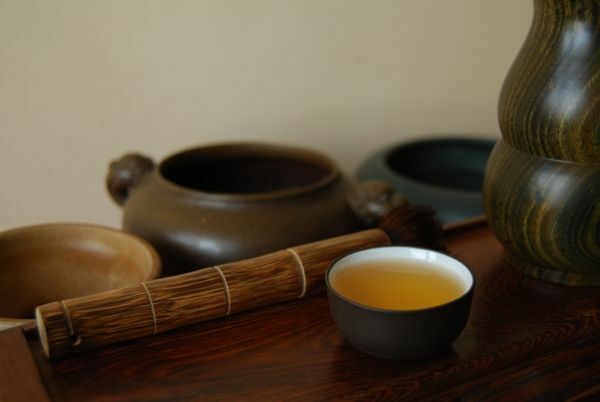 So, I retrieve our hongcha pot, and continue as if drinking Bailin Gongfu. It lasts well, and provides much enjoyment, in its sweet, candylike, accomplished manner. 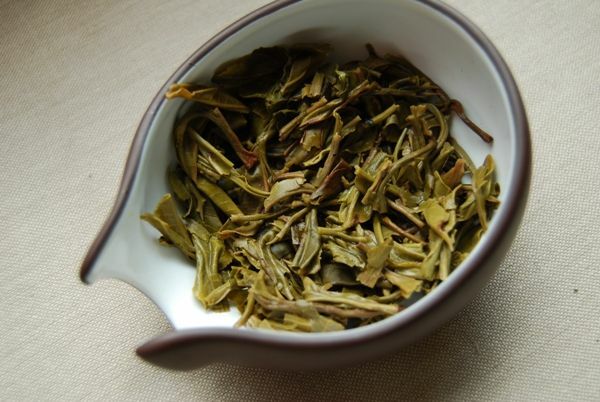 2009 Yangpinhao "Mengku Yesheng Zhutong"
Hand-selected, hand-grown, and hand-picked - just like good tea. 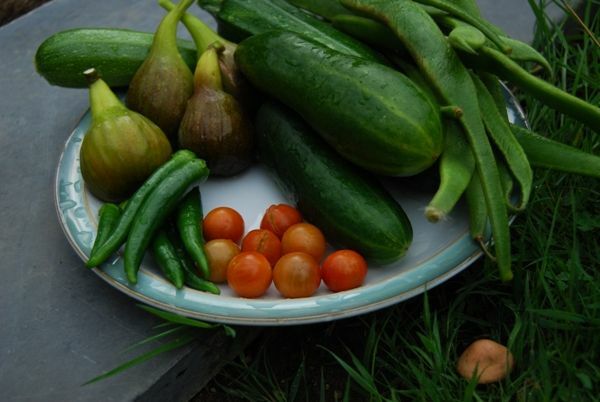 The flavour and character of such products exceeds the mundane versions to such a great degree that I am left wondering why we eat anything else apart from home-grown vegetables, or drink anything else other than first-class tea. The answer is, of course, availability. 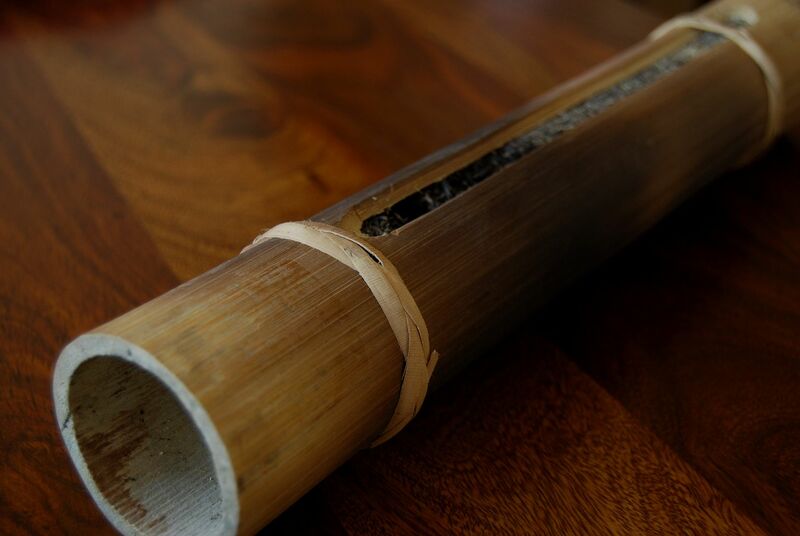 This "zhutong" [bamboo-tube] tea, kindly provided by Keng represents our first foray into such pu'er. You may recall my aversion to novelty products, whether they be "braided leaves", wrapped in tangerines, or any other type of crazy packaging designed to attract the eye. 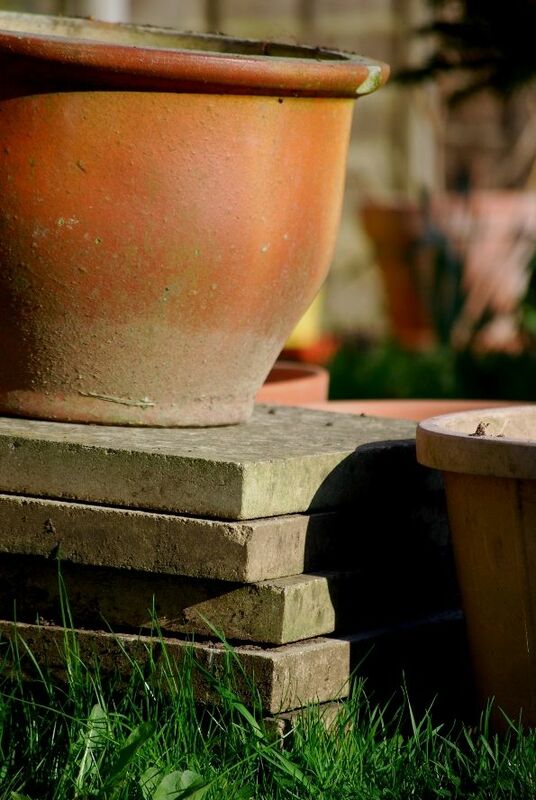 This one, however, has a charming rustic feeling, and so I attempt not to be (too much of) a grouch. 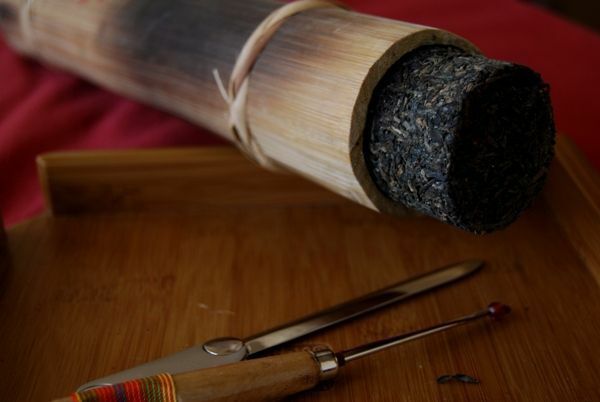 The design of the tong has clearly been considered well: tea may be extracted from the tube by inserting an implement into the groove that runs along its length, and then taking a quantity to the opening at one end. 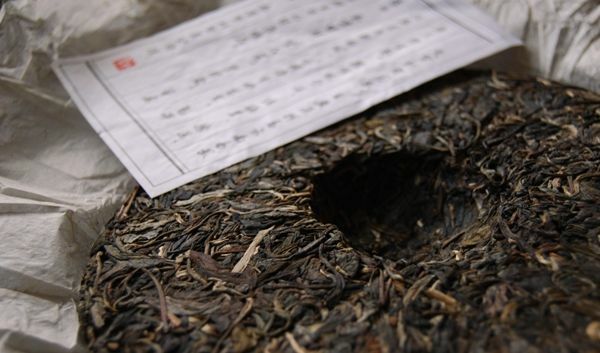 A cylindrical section of tea pops out, along with perhaps one of the most potent scents in pu'er I have ever encountered: the entire room is filled with thick, sweet fruitiness. 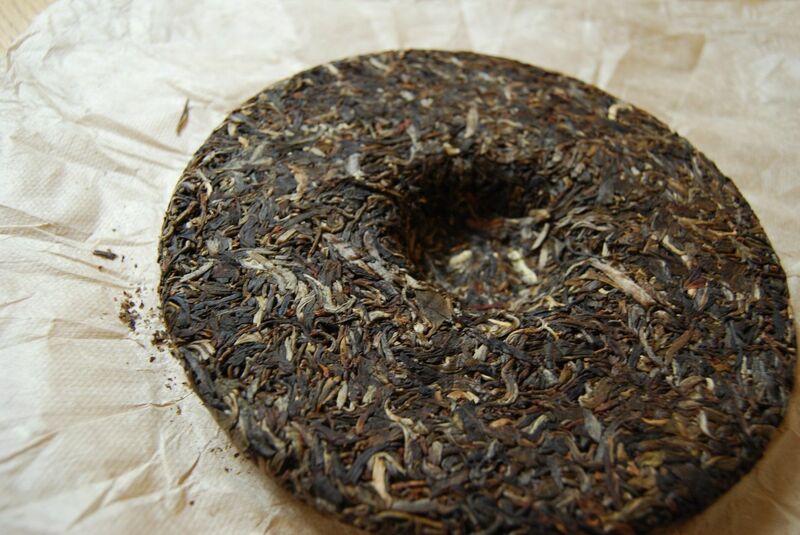 It reminds me of the freshest of purple-leaf pu'er, with the fruitiness dial turned up to "11". 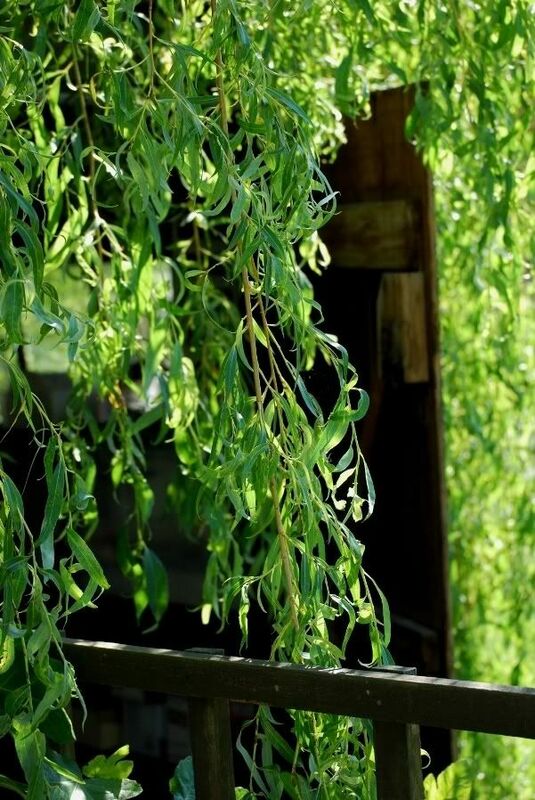 The small leaves look picturesque, and have been well handled - they are mostly whole, and have a healthy, furry sheen. Such activity! Pictured below is the yellow brew straight from the pot - it is almost green, when viewed in natural light, such is its freshness. Thirty seconds in the air and it has visibly oxidised to the thick orange pictured above. The transformation is quite remarkable. I am left dazzled - such aroma and activity are really rather surprising. The aroma and flavour of the tea are, however, quite heavily roasted. "This reminds me of my roasted wheat tea", notes Lei, referring to the grains that she hand-roasts in a wok for afternoon (caffeine-free) drinking. As a result, what could have been a walk through fresh, Mengku territory turned out to be a constant, fairly constrained wander through a roasted-maocha that tastes pleasantly sweet, but goes no further. Thanks again for Keng for the opportunity to try such an interesting new experience. P.s. To the 23% of my readers that use Internet Explorer: I recently loaded the Half-Dipper into IE to be surprised to see that the background doesn't scroll properly. I hope that my recent fix for this works for you! I apologise for not spotting it sooner - I usually use Firefox, which the remaining three-quarters of my readers seem to use, according to Google. If you're an IE-user, then you should be all set, now. Before I turned thirty, the year didn't really affect me - winter or summer, it was all the same to me. 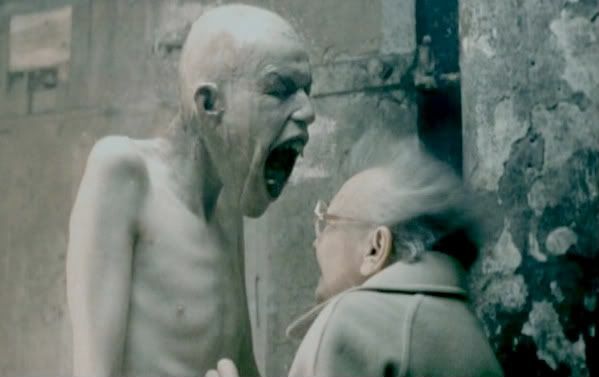 Since becoming a wizened old geriatric, the cycle of the year becomes more and more significant. The changing rhythm of the year genuinely affects me. Some ways subtle, some ways not-so-subtle. Summer is a lovely time here - all the undergraduates have left, along with the need to teach them, and my days are filled with performing long-neglected experiments, writing up my results, and talking to interesting people about their ideas. Some of the best ideas come from the newest graduate students, their minds uncluttered by what should and should not be done. My interns from this summer have finished their placements (some even getting as far as writing their own academic papers from their short projects with me), and, for the next month at least, everything is calm and unhurried. 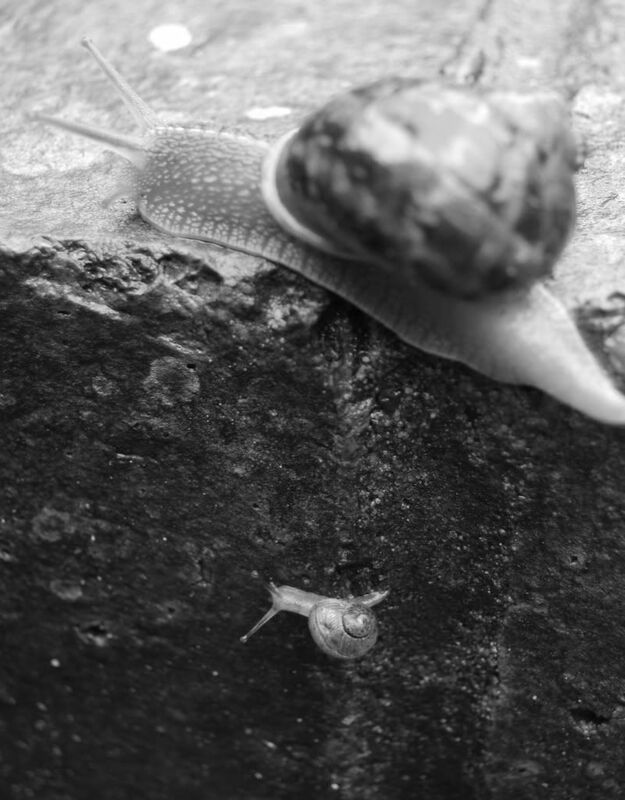 It is that feeling of utter quiet that you suspect can only be followed by a period of more hectic pace. For now, though, the streets have quietened down as the schoolchildren have started their new term. The university doesn't start Michaelmas term for another five weeks, which is five weeks that I hope to fill with a combination of welcoming our son into the world, finishing off our house's renovations so that he can be comfortable, and then, finally, writing a clutch of papers. This year, I changed colleges. It's the same university, but we have some 32 or so colleges within it*, which makes for a whole lot of confusion. 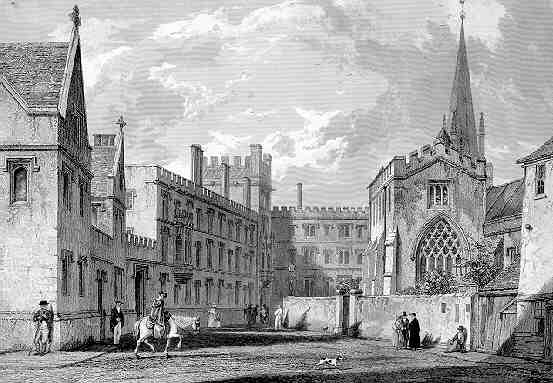 My new college is, ironically enough, one of the oldest colleges. It's a lovely, quiet place - you step through the doors from the busy traffic of the street, and suddenly leave all the noise behind. Maybe its quietness is partly responsible for The Hobbit and the first two books of The Lord of the Rings trilogy being written here. *I believe Harvard was set up after our university-comprised-of-many-colleges model, but they didn't get past building more than one college; hence "Harvard College", where one reads undergraduate degrees, was, so I understand, the first of many originally-intended colleges. The college system certainly has some advantages, it must be said, despite (or perhaps because of) the decentralisation. During term-times, college has a certain hushed industry about it as students go about their tutorials, and the tutors go about eating their lunches and dinners ("never knowingly underfed" being our unofficial motto). During the summer-time, when all the teaching staff are going about their research, the college is let out to bus-loads of visiting American students. They seem to enjoy themselves for their few weeks; they learn languages and some humanities while they are here, getting a taste of what they insist on calling "Arxford". 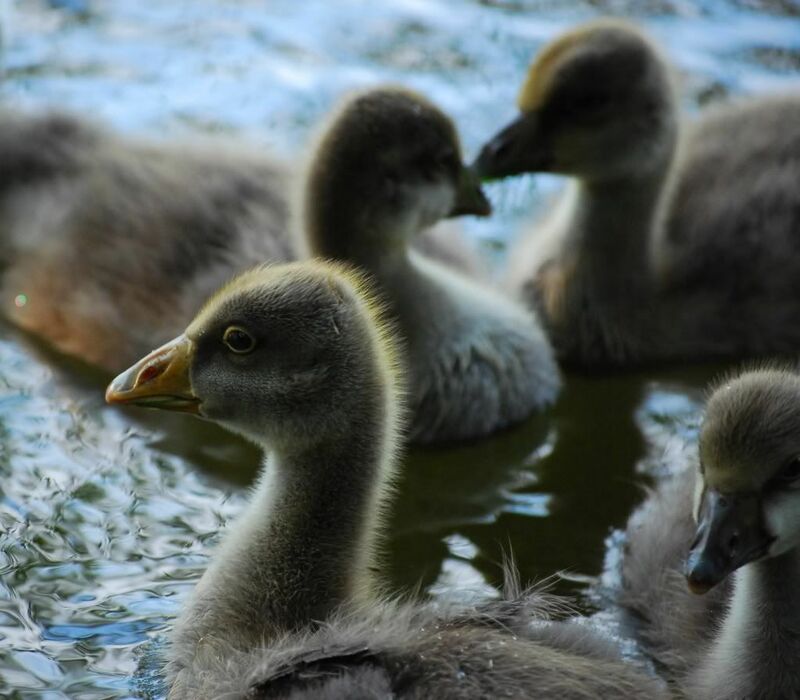 They are a lively-minded bunch, who have little to do with us, except for the fact that they seem to yell at one another across the quads, shattering the peace. Last week, a crusty old don stood up from lunch to close the parlour window, mumbling something uncomplimentary about our visitors. However, nothing lasts forever - these visitors will soon be gone, in time for our new intake of undergraduates, and life will return to normal, renewing itself with the start of the new academic year. The annual cycle is a lovely thing, and has a charming rhythm, like a trusty old clock. Teachums and the 2009 HK Henry "Mahei"
Recently, Lei and I were fortunate enough to be visited by our teachum who goes by the name of "Apache" in them there Interwebs. Apache is our favourite biochemist in the land, despite the fact that he works in The Other Place. Nobody's perfect. 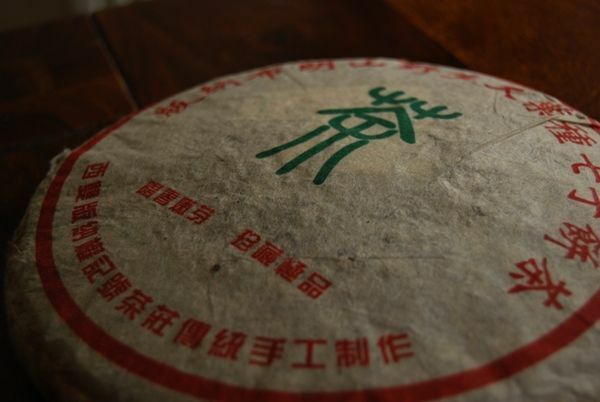 We marched through some fine brews of a 1960s Liu'an kindly provided by Essence of Tea (thank'ee again), which was smooth and enjoyable, and also enjoyed this 2009 cake from the Xianggang Hengli Tea Co., also known as "Hong Kong Henry". Apache had bought this cake from Hong Kong's Lau Yu Fat Tea Shop [Liu Yu Fa Chazhuang to the non-Cantonese speakers] over the telephone, amusing us with stories about how the vendors weren't really very interested in selling a few cakes to a remote far-off island. Most of their business is local, and the Internet apparently holds little interest for them - I sympathise, being something of a Luddite myself. I'm unsure if this "Hengli" is the same as the "Hengli" that produced the delicious 1997 Henglichang Bulang sold by Essence of Tea (where it is sold under the name "Henlichang"). I don't believe that these two entities are the same, as the "Heng" character is different in each case. However, you never know. As always, I look forward to being proven wrong, should you have any further insight, dear Reader. 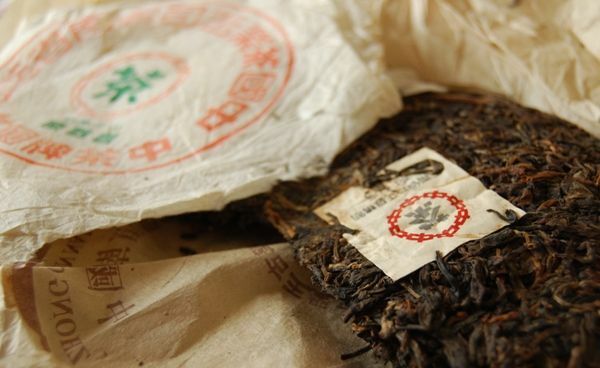 My only previous exposure to this producer was the 2003 Menghai "Hong Kong Henry" 7542, sold by Houde. Amusingly enough, that tea was dubbed the "Scholar Tea" by the owner of Houde, which simultaneously brought a smile to my face and a heaving, wrenching feeling to my stomach. You may be familiar with my feelings on the word "scholar" being used for the purposes of selling tea or books about tea, concerns of which I shall not bore you with any further. I wasn't thrilled by the 2003 Houde cake, but I may have been alone, as I remember that many folk have thoroughly enjoyed it. I found it aggressively acidic, with little else of note apart from a background of molasses. It deserves revisiting, however, as it has been three years since I've touched it. This 2009 cake, if anything, suffers from completely the opposite problem. It is a charming cake, of that there can be no doubt. Apache, Lei, and I enjoyed its sweet body, notes of leather and grain in the finish, and a pronounced cooling sensation. 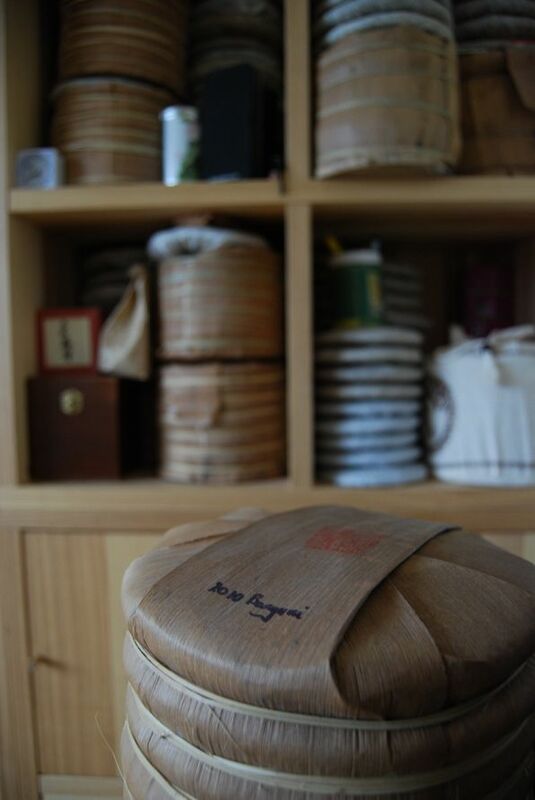 However, the Hong Kong tea-world is abuzz with comments of this tea's gentility - is it too gentle to age? On drinking this cake alone this morning, I came to the same conclusion: I had to use lots of leaves (200% of my normal amount) and employ long infusions to get some real character out of it. Pushed this strongly, it starts to object by getting a bit cracked around the edges; show it a gentler hand and it peters out to a thin, sweet yellowness. I will continue to experiment with this little fellow until I get the best out of it - thanks again to Apache both for the generous gift of this cake, and the more generous gift of your company for an afternoon. Lei and I hope to see you again soon - perhaps we can arrange a "tea day" with some other UK-based drinkers, too. Taobao Experiments: the 2001 Yuanyexiang "Gancang"
Taobao can be a cruel mistress. Sometimes she waxeth wroth. You may remember from an aeon ago that the 2001 Shuangjiang Mengku "Yuanyexiang" [yooan-yeah-shee'ang] cakes were super popular. 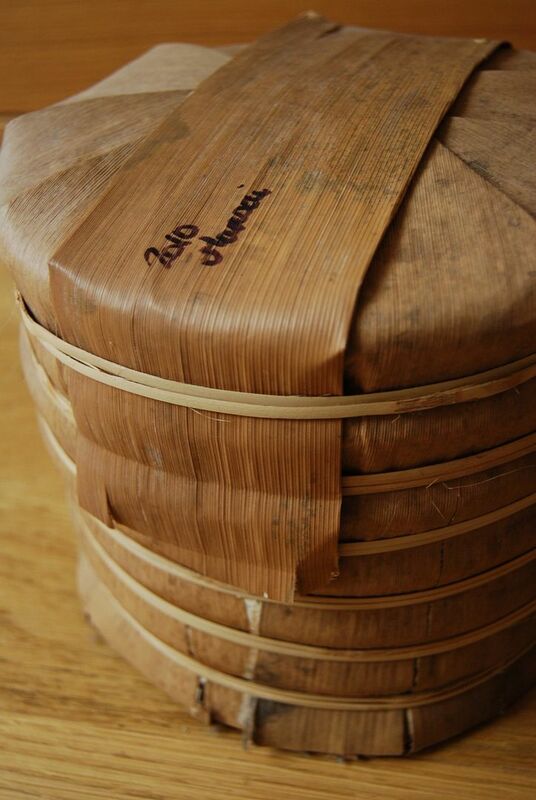 They came in shicang and gancang varieties. The proprietor of Houde must be planning to put his child through college from the proceeds that these cakes generated for the 0.02 femtoseconds that they were in stock - kudos must be given to Dr. Li on knowing how to market to an audience. Since that date, my estimation of the pair of teas has decreased in accordance with my experience (which is still, of course, humble). While I find them to be enjoyable, they are not honest, raw shengpu, and I am now of the opinion they are certainly not worth the price that was being asked for them. Again, no foul to Dr. Li, because it is every merchant's goal to sell products at a good price - it is their business, after all. However, they are just Shuangjiang Mengku cakes. With all that said, they still hold a certain cachet, or at least, a certain place of endearment in my heart. During a Taobao purchase last year, my dear bratwurst-nibbling, sauerkraut-consuming, weissbier-quaffing friend, Hr. Dr. Kim and I decided to go 50-50 on a cake claiming to be the 2001 "YYX" Gancang. We bought it from 乔韵茶行 [Qiaoyun Chahang], for Heaven-knows-how-much. Fully expecting a fake, we went into the purchase with our eyes open, just for a bit of fun. Ladles and jellyspoons, I present to you the findings of our investigations. The (half) cake has sat on my shelf for over one year, and I recently found that rare combination of effort, time, and will required to sit down with it and give it the proper amount of consideration. It looks exceedingly ropey. The wrapper was almost shredded, which is how it was sent by the vendor - the vendor themselves had wrapped it in plastic, and our Taobao handler had then wrapped it in bubble-wrap for the journey to Europe. The cake size looked about right, but the wrapper barely covered it due to its advanced state of knackerednicity. Opening the cake, the neifei was similarly comic: it was heavily stained, as if to indicate prolonged pressing against the surface of a cake, and yet it was included almost loose - it appeared to have been a separate neifei tucked under one or two longer leaves as were available, rather than being pressed into the cake. So, either it used to be pressed into the cake, had come loose, and had been gently tucked back in... or it was a fake cake, with a neifei tucked into it. Presentation aside, the leaves are lovely, and are similar to my samples from Houde. Clean, dark, dry, and mostly whole, they look the part. 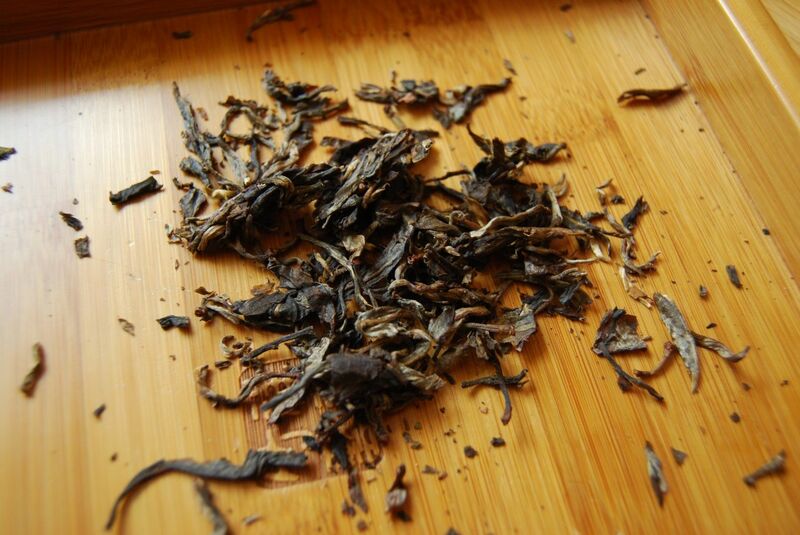 The blend, as before, comprises both rusty tips and small-to-medium leaves, with the odd rare stem. Out it comes - orange, sharp, and woody. It is very clean. However, it is not complex, and lacks the heavy tobacco that I remember from the original's processing. Quite powerful, and with decent kuwei [bitterness], with long hints of red, woody flavours, it is actually quite enjoyable in and of itself. "All signs point to 'no'", as the Oracle of Delphi once said. While not worth the price that we paid, it is a bit of fun in its own right. And so, to end where we began, learn ye well: Taobao can be a cruel mistress, and this day she hath waxeth wroth most mightily. 2006 CNNP "Yun Tianxia Mengku Daxueshan"